I have been using the Jessem Clear Cut TS Stock Guides for about two months now on my table saw and I felt it was time for a review. These are similar in concept to their Clear Cut Stock Guides for the router table but they have some unique differences that make them significantly better. First, let’s start with unboxing and installation. The guides are beautifully packaged and come with the guides themselves fully assembled. I have a SawStop PCS with the T-Glide fence onto which you first attach a T-Slot rail. This rail is very well engineered for both installation and use. For installation, the manual clearly indicates where it should be positioned on the fence – both in terms of front to back as well as side-to-side (so the guides can be moved out of the way without needing to be removed). The guides come with a drill bit for drilling the holes for mounting the self-tapping metal screws. You first position the rail and then move it down 1/2” where the rail then has a series of small pilot holes you use for drilling. You then move the rail back up 1/2” and now all your pilot holes line up with screw holes and you attach it. Once the guide is installed, the stock guides easily slide on and are tightened down. The whole installation took probably 15 minutes with 10 of those minutes being me measuring 3 times and drilling once. The innovative part of these guides is how you set their height. You loosen the clamping knob and move out each guide and then drop the black metal portion directly on top of the piece of wood you are about to cut and then you tighten the knob (or you can keep a selection of common sized scraps for this purpose). Unlike the router table guides, you do not set the wheels on the wood. Internally to the guides is a spring of exactly the proper tension to raise the guides when the wheels contact your workpiece. With the router table guides, you align their height by putting the wheels on your workpiece and then you push down and tighten the clamping knob. This works but is inexact and results in different downwards pressure on your wood as it depends on how hard you press when you set the wheels. You also have to crank the knobs hard with your hands as they are maintaining the tension (you sometimes have to use a hex key to tighten them properly). The table saw version with the integrated spring makes it both much easier to setup and gives much more consistent downwards pressure. This is a great piece of engineering. The wheels on the guides have a 5° angle that push the workpiece into the fence. Thus the guides hold your work down and into the fence. This eliminates the need to operate a saw in a manner that has you pushing the workpiece forward into the blade with one hand and sideways into the fence with your other hand (while also holding it down). I used to use feather boards to handle the sideways part of pushing but the guides are superior in many ways. 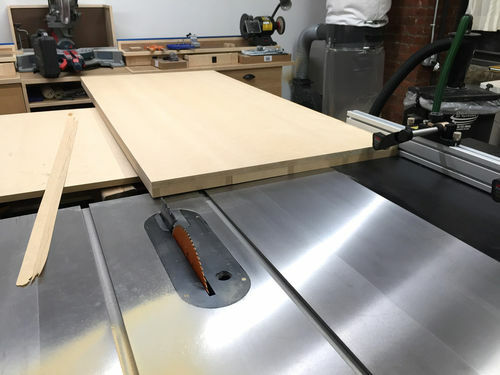 First they work when you are cutting repeated width pieces out of a single wide board without requiring readjustment or repeatedly resetting feather boards. Second, they work even when the outside edge is uneven such as when first cutting rough stock to width. I personally find this to be a big benefit as the rough edge always used to give me splinters and often varied too much for a feather board to give consistent pressure. I use the guides for all cuts 2 1/2” or wider. The front guide takes about 2” of space and you need room for your push stick. For pieces less than 2 1/2” thick, I use the one or two Grr-rippers from Micro Jig. I find no drawbacks to having these on my saw. When I use them, they are fast and easy to setup. When I don’t need them, they fold up and are out of the way. To me when something is easy to use, you tend to use it more. Of course woodworkers have successfully ripped wood for many years without these guides so they are not essential. However I do find that for me they are a better and safer way to rip wood so I both use them as often as possible and heartily recommend them. Thanks for your review. The one question I’ve always had about these kind of guides is how you use a push stick with them. You stated that you only use them for pieces 2-1/2’ or wider. Since I rip a lot of pieces less than 2-1/2” I felt these would be a problem. Guess I was right. All the sales-pitch videos kind of avoided that point. BTW I also use the Gripperrrrrs and they are great. As long as I can use a push stick between these and the blade, then I think they would be very good. Thanks again for your review and clearing up a question I have had. Thanks for your review. The one question I ve always had about these kind of guides is how you use a push stick with them. You stated that you only use them for pieces 2-1/2 or wider. Since I rip a lot of pieces less than 2-1/2” I felt these would be a problem. Guess I was right. All the sales-pitch videos kind of avoided that point. Yes, they not only gloss over this point they have a few advertising photos that show the guides out so far as to completely obstruct a push stick. Glad if I was able to help. I have considered buying these guides. Thanks for your well-written review. I’ll use a piece of scrap wood for a push stick that is thinner than the wood I’m cutting. Let’s say I’m ripping 8/4, a 4/4 or 3/4 push stick can be used to get the wood being cut passed the rollers by going underneath them. Or you can pause, go over one roller, pause, go over second. Doesn’t sound intuitive but it’s easy in practice. I just ordered a set today after uneven pressure while cutting dadoes required a strip to be glued in/planed even/recut. They seem like they’ll make my saw even safer, my cuts cleaner, and in the case of dadoes with the blade buried in a sacrificial fence, my rabbets will be consistent and repeatable. Have you used them in this application yet, Ottacat? I just ordered a set today after uneven pressure while cutting dadoes required a strip to be glued in/planed even/recut. They seem like they ll make my saw even safer, my cuts cleaner, and in the case of dadoes with the blade buried in a sacrificial fence, my rabbets will be consistent and repeatable. Have you used them in this application yet, Ottacat? I haven’t used them in that application yet but I certainly believe they will be a big help. I agree they are likely to give a more even consistent rebbet. I also have the jessem guides mated to the vsc fence.The level of safety afforded by the guides cannot be overstated,and yes as stated by others they cannot be used in all cuts.I highly recommend the fence and guides. Good review, in general I love their products and glad they work for you. I’ve been using the grippr’s for years and having that positive control is very good with stock. Good review, in general I love their products and glad they work for you. I ve been using the grippr s for years and having that positive control is very good with stock. Just came across this post after a quick search. I’ve been eyeing these as a good method to cut sheet goods down and keeping the edges square. I find most projects requiring 1/2” & 3/4” plywood I can rip the board to get better control for cutting the parts from but keeping it tight to the fence hasn’t been easy. I use a 36” Saw Stop cabinet model and love it but wish at times I had gone for the 52”. I built a nice outfeed table which really helps with the panels on long rips. So far I haven’t found anyone complain at all about this product. I have one of their router lifts and it’s been a pleasure to use. In fact I’m working on the cabinet to set the Woodpecker’s phenolic top and fence on to make it a bit easier to use and store bits and so on. Thanks for the great thread.